One of my favorite sayings, often repeated by my granny, was that she didn’t get gray hair lazing around in the sun. It was mostly directed at my dad whenever he tried to trick her into believing something. I’ve been at the receiving end a couple of times, too. What it basically means is this: one doesn’t reach a ripe old age without gaining some kind of experience. Experience is a wonderful thing; you gain it in happy as well as sad times. You gain it as an employee or an entrepreneur. You gain it without making any significant change to the world or while you make it go round. So if you have worked in a particular industry for any length of time (or in different industries, for that matter), you might have gained a few grey hairs along the way. 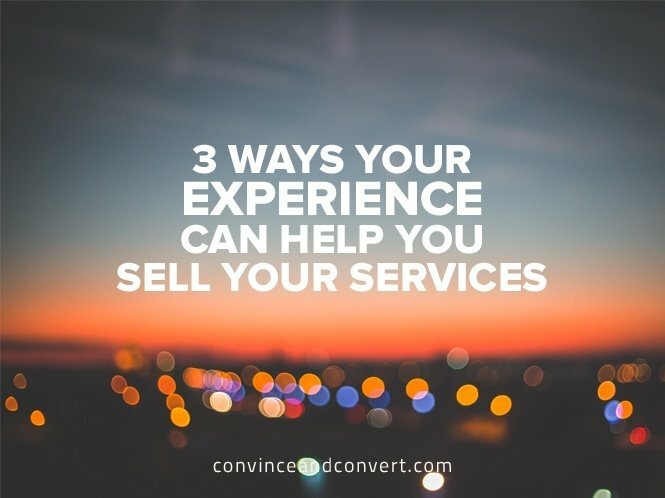 Now you want to put this experience to use. Find a way to use this learning and experience to educate and enlighten people who might be in the same situation as you were earlier. Make their life easier. But what’s in it for me, you ask? A lot of money! Set up a website or a blog, pour all your years of experience into a nice content guide, and start promoting it on social media and other marketing channels. Meh, you say. That’s the same thing 50,000 other “experts” already told you. Try it just once, and watch the subscribers roll in. Take Helen Sanders: she has 50,000+ email subscribers who get access to free content including healthy recipes, weight loss tips, and nutrition advice. I’ll grant you that Helen’s methods of monetizing her experience can be quite challenging and time-consuming, what with all the content she churns out with painstaking regularity. Another option that takes less time but requires the same amount of experience comes from Robert Mening and his site WebsiteSetup.org. Robert Mening is a web designer and developer who’s been in the profession since 2004. That’s over a decade of website-making experience. He has experience with WordPress, Joomla, and Drupal, the three most popular CMSs of the web, which makes him a subject expert on the topic. He put this decade-plus of experience into an easy-to-understand guide, which is available for free. Plus, he takes care of his website visitors by answering all their questions within two or three days. So far, he has helped over 7,000 people build websites through his guides. You can take a leaf from Robert Mening’s strategy and use it in your own field of expertise. The first baby step (read: giant leap) you have to take is to create an awesome guide. Make it as simple and appealing as you can. Add visuals, jokes, and other experts’ comments. Become an affiliate and market partners site on your website. Personally refer partner sites to people. “But won’t I lose people’s trust doing that?” you might ask. If you choose your partners wisely, and if you refer useful sites to people, it won’t harm your position or reputation. If you have been in the B2B sector for any amount of time, you might have come across Gordon Graham. The guy has over 200 whitepapers, 1000 magazine articles, 75+ workshops, and a $197 crash course in B2B content to his credit. He has all his fingers in the proverbial pie and masterfully monetizes his experience writing whitepapers for big players like Adobe, Google, Oracle, Verizon, HP, and Hitachi. And it wouldn’t be fair if I didn’t mention Tim Ferriss of The 4-Hour Workweek fame here. Dubbed “this generation’s self-help guru” by New York Magazine, Ferriss has written several books and uses his experience by advising countless startups like Shopify, TaskRabbit, and StumbleUpon, just to name a few. It is very simple these days to make an ebook or design your own online training course for free. No matter what field you are in, you can address several audience pain points using ebooks and online courses. 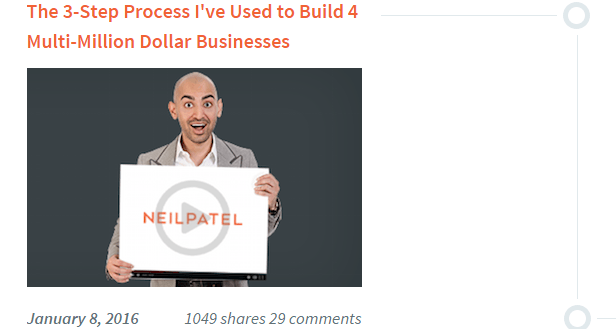 Marketers need little convincing or converting when it comes to trying out strategies recommended and endorsed by Neil Patel. From webinars to blogs to conferences, he uses every medium to share his experience—and makes the most out of it. 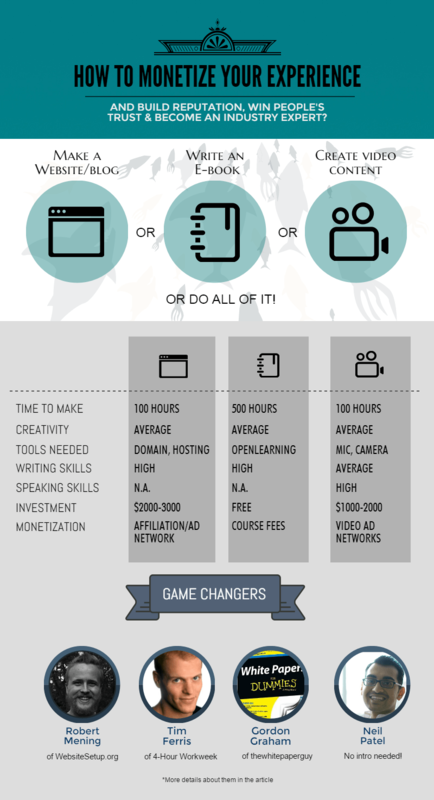 If you’re bitten by the online marketing bug, Neil has set up an entire university chock-full of video mini-courses over at Quick Sprout. The best part? It’s free! On top of that, he’s always doing informative webinars on startups, entrepreneurship, and anything closely related to business—again for free! That includes sharing the secrets of building multiple multi-million dollar businesses. YouTube isn’t the only place where you can monetize your videos—you have Facebook, Hulu, and DailyMotion at your disposal, too. Make a cool video once a week, and earn passive income for the rest of your life! How’s that for a working retirement plan? If you’re wondering if these ideas are right for you, let me be honest: it depends. How much gray hair do you have? Did you get it lazing around in the sun? If not, go ahead. Put your years of experience to use, and help others to gain from it too. Did I hear you say you’re an expert in judging noodle art?